Ending 2018 with travels to Cusco in Peru with further hands on experience, product knowledge and explorations to bring you the best air and land itinerary packages and tour services by our Certified partners all over South America. We are direct travel suppliers of South America. Contact us. Discover what WE CAN DO for YOU as 2019 begins. Cusco airport is only a 5 minute taxi ride or a 20 minute bus ride to the centre of Cusco Town, so easy and simple. Drink plenty of water to assist with possible headaches from the high altitude of 3,400 metres above sea level. The town has a plaza with beautiful gardens and trees overlooking a cathedral and a basilica, built during the Spaniards during the Spanish conquest colonisation that started around 1532, countless accommodation options, restaurants, cafes, canteens and local shopping showcasing their amazing and colourful creations from local products. You name it they have it and what a way to remember your travels by purchases of things like hand and machine knitted ponchos, scarves, hats, gloves, wallets, bags, backpacks and souvenirs galore, not to mention silver jewellery and earth’s natural stones, home decorations, the list is endless. You must experience a night on the town to enjoy the locals’ way of having a night out with friends. 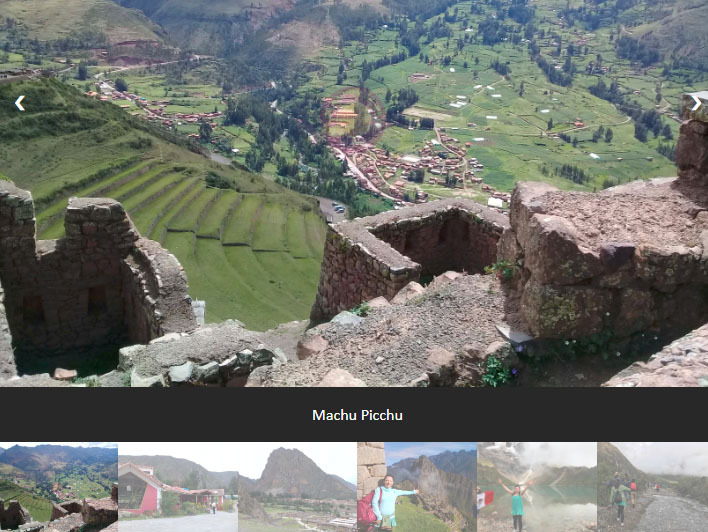 A morning Tour to Sacred Valley starts about 8 am to visit the valley of the Incas to see the remaining and preserved ruins of an Inca village. If you like history and archaeology you must include this tour. The trekking is a challenge so you need to have a reasonable fitness durability but once there it is worth discovering all the amazing stories about the Incas’ systematic calculation of the compass’s four corners (Southern Cross Stars) looking out for the enemies/invaders, the direction of the wind’s most powerful point, equal to the coldness of a modern refrigerator, for food preservation by building storage rooms into the mountain faces, still evidence exists today, and how they created what they call terraces for agriculture farming. One could suspect these terraces to be rice fields from the distance; however, they were for harvesting crops like potato, corn and quinoa, just to name a few. Just looking at the hard to believe height of these mountains with their individual shapes, curves and lines is a natural wonder. The tour guide enriches you with stories of discovery about the Inca’s life and how they developed and structured their life using natures resources without any modern day technologies and machineries, well thought out calculations demonstrated how sophisticated their intelligence was. A Buffet Lunch is included with this tour in a town on route called Urubamba. After the Sacred Valley tour there are options to travel by train to a town called Hot Waters, there you need to stay overnight to meet your next day tour to Machu Picchu. Or you can stay on the tour to visit other fascinating villages and towns that still hold fascinating evidences about the Incas then returning to Cusco to start another Tour. An Expedition Train experience occurs on this day. While staying the night in Aguas Calientes, upon arrival into the town, your transfer takes you to your hotel. Check-in but don’t sleep, take yourself to an amazing and incredible restaurant called INDIO FELIZ. Upon entering your eyes will simply pop out. What you see is hard to believe but it is testimonial how popular the place has been over its life time, evidence is posted, stapled and glued to every millimetre of wall space with business cards and money notes from all over the world. The personal ornaments, sculptures, art works and themes that decorate this very intimate but funky restaurant and bar. You MUST go there for your dinners and lunch. You won’t have time for any breakfast as the tours start early. Write us an email after you visit this place and let us hear what you’ve got to say about it. The owners are a couple from France who established it pouring out their hearts’ desire and ever since, they’ve been a success. Whatever they are doing is evident. There, you must try a refreshing drink with a concoction of spirit, mint and lemonade made from freshly squeezed lemon. I never felt better after drinking this quick fix thirst quencher. After that, you can continue on with icy cold beers. I have seen and been into many dining places all around the world, this place hits the top of the list. The staff and service is so personally attentive to every detail, making sure you are completely content before you depart. I was personally noted by the owner, who saw me filming her restaurant that, after I paid and almost out the door, she calls me and says ‘Excuse me please come, I want to give you a gift. I want to thank you for coming’. She gave me a mug with the restaurant’s name and location. I thanked her for being so kind and left. Receiving a gift made me realise how pro-active she was with her staff and her customers because I noticed this, but didn’t realise she would be the owner at the time. She came across like a customer chatting to people near her table and asking waiters about drinks or a dish to order. Well done to them. Machu Picchu is a UNESCO protected site since 1983. You will learn the amazing expedition of Hiram Bingham, who did all he said in his proposal to find and preserve what we see n Machu Picchu as today. Let us organise your trips to learn for yourself from the locals and native people of Cusco. The tour guides we engage have a minimum of 5 years of studies to become Certified Tour Guides as well as being natives. We recommend the morning Tour of Machu Picchu. We buy your tickets in advance to guarantee your entrance and we buy the bus tickets that take you up and down for Machu Picchu. After Machu Picchu Tour of the site you have some options to climb any one of the mountains that surround Machu Picchu to complete your full day experience. It involves a lot of hiking and trekking and it is even more awesome when you are with a small group of people to share the experiences. There are many tour guides; however, we have direct contracts with Certified Operators. They pride themselves on how they deliver to the visitor and we pride ourselves developing itineraries using their products and services that best suit your needs to see places in the short time you are there. All programs and itineraries tick like a clock so that you get the best out of your trip. All you need to do is be fit and have mountains of energy to take all of it in. The Vistadome Train trip was back to Cusco for the next day tour. A 5 AM tour commences you with a three hour trip to enjoy a breakfast in a little village called Soraypampa before heading to Lake Humantay approximately @ 4,300 metres above sea leave. Did I hear a sigh? Yes? That’s right you will discover how healthy you are when you climb the Humantay mountain to the top to see the Lake. It takes a hike of about 1 hour 20 minutes to 1 hour 45 minutes. You must not miss the opportunity to visit. You can see the incredible overlooking Salkantay Andes Glacier Mountain of Peru approximately @ 5,800 metres above sea level. You have time to explore and take photos, then upon going down to the meeting point, a drive back to the same location for Lunch. Breakfast and Lunch are included in this tour. Then it’s a happy trip back to finish off, some will chat away exchanging experiences and others will simply sleep from exhaustion. A popular chocolate and cheese pizza with a paper thin pastry baked in a wood fire oven. A mouth-watering coffee and fresh cream frappe Peruvian express coffee and local homemade ice cream, just the thing to ignite your energy. Empanadas, a homemade tasty pastry filled with condiments. One had minced meat and the other had black olives and cheese. Steamed white corn sold by the sidewalk stalls just before you commence your Sacred Valley Tour. Must eat here: Indio Feliz Restaurant. Cusco, often spelled Cuzco, is a city in southeast of Peru, near the Urubamba Valley of the Andes mountain range. It is the capital of the Cusco Region and of the Cusco Province. In 2013, the city had a population of 435,114. Located on the eastern end of the Knot of Cuzco, its elevation is around 3,400 metres above sea level. The site was the historic capital of the Inca Empire from the 13th until the 16th-century Spanish conquest. In 1983 Cusco was declared a World Heritage Site by UNESCO in Paris with the title "City of Cuzco". It has become a major tourist destination, hosting nearly 2 million visitors a year. The Constitution of Peru designates it as the Historical Capital of Peru. The Killke people occupied the region from 900 to 1200, prior to the arrival of the Inca in the 13th century. Carbon-14 dating of Saksaywaman, the walled complex outside Cusco, established that Killke constructed the fortress about 1100. The Inca later expanded and occupied the complex in the 13th century. In March 2008, archaeologists discovered the ruins of an ancient temple, roadway and aqueduct system at Saksaywaman. The temple covers some 2,700 square feet (250 square metres) and contains 11 rooms thought to have held idols and mummies, establishing its religious purpose. Together with the results of excavations in 2007, when another temple was found at the edge of the fortress, this indicates a long-time religious as well as military use of the facility. Cusco was long an important centre of indigenous people. It was the capital of the Inca Empire (13th century–1532). Many believe that the city was planned as an effigy in the shape of a puma, a sacred animal. How Cusco was specifically built, or how its large stones were quarried and transported to the site remain undetermined. Under the Inca, the city had two sectors: the urin and hanan. Each was divided to encompass two of the four provinces, Chinchasuyu (NW), Antisuyu (NE), Kuntisuyu (SW) and Qullasuyu (SE). A road led from each quarter to the corresponding quarter of the empire. According to Inca legend, the city was rebuilt by Sapa Inca Pachacuti, the man who transformed the Kingdom of Cuzco from a sleepy city-state into the vast empire of Tawantinsuyu. Archaeological evidence, however, points to a slower, more organic growth of the city beginning before Pachacuti. The city was constructed according to a definite plan in which two rivers were channelled around the city. Archaeologists have suggested that this city plan was replicated at other sites. The first three Spaniards arrived in the city in May 1533, after the Battle of Cajamarca, collecting for Atahualpa's Ransom Room. On 15 November 1533 Francisco Pizarro officially arrived in Cusco. "The capital of the Incas...astonished the Spaniards by the beauty of its edifices, the length and regularity of its streets." The great square was surrounded by several palaces, since "each sovereign built a new palace for himself." "The delicacy of the stone work excelled" that of the Spaniards'. The fortress had three parapets and was composed of "heavy masses of rock." "Through the heart of the capital ran a river...faced with stone." "The most sumptuous edifice in Cuzco...was undoubtedly the great temple dedicated to the Sun -studded with gold plates- surrounded by convents and dormitories for the priests." "The palaces were numerous and the troops lost no time in plundering them of their contents, as well as despoiling the religious edifices," including the royal mummies in the Coricancha. Pizarro ceremoniously gave Manco Inca the Incan fringe as the new Peruvian leader. Pizarro encouraged some of his men to stay and settle in the city, giving out distribution to do so. Alcaldes were established and shared on 24 March 1534, which included the brothers Gonzalo Pizarro and Juan Pizarro. Pizarro left a garrison of 90 men and then departed for Jauja with Manco Inca. Pizarro renamed it the "Very noble and great city of Cuzco". Buildings constructed after the Spanish invasion have a mixture of Spanish influence with Inca indigenous architecture, including the Santa Clara and San Blas neighbourhoods. The Spanish destroyed many Inca buildings, temples and palaces. They used the remaining walls as bases for the construction of a new city. The city was retaken from the Spanish during the Siege of Cuzco of 1536 by Manco Inca Yupanqui, a leader of the Sapa Inca. Although the siege lasted 10 months, it was ultimately unsuccessful. Manco's forces were able to reclaim the city for only a few days. He eventually retreated to Vilcabamba, the capital of the newly established small Neo-Inca State, which lasted for another 36 years but he was never able to return to Cuzco. Throughout the conflict and years of the Spanish colonisation of the Americas, many Incas died of smallpox. Cusco stands on layers of cultures, with the Tawantinsuyu, an old Inca Empire, built on Killke structures and the Spanish replacing indigenous temples with Catholic churches and palaces with mansions for the invaders. Cusco was the centre for the Spanish colonisation and spread of Christianity in the Andean world. It became very prosperous thanks to agriculture, raising cattle and mining, as well as its trade with Spain. The Spanish colonists constructed many churches and convents, as well as a cathedral, university and Archbishopric. At the beginning of the 20th century, the city's urban sprawl spread to the neighbouring districts of Santiago and Wanchaq, an area in Cusco.